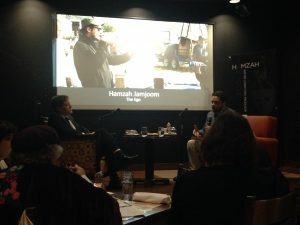 On January 9, Busboys and Poets (Takoma) hosted a conversation between the Saudi filmmaker Hamzah Jamjoom and John Hanshaw, Founder of the Washington Film Institute. Born in Jeddah, Saudi Arabia, Hamzah Jamjoom is a writer, director, and actor currently based in Chicago. From a young age, Hamzah exposed himself to the art of storytelling and decided to study computer graphics animation. His first big break was the successful IMAX feature film titled Arabia 3D, where he was part of both the cast and the crew. As he began to acquire some recognition for his work through short films and music videos, he decided to use his position as a filmmaker and storyteller from the Arabic world, to subvert existing narratives surrounding the Middle East and the Islamic world and explore the various conflicts faced by the artist’s “ego”. The main topic of last evening’s conversation was the artist’s ego, and the tendency of the artist to always want to present the best version of himself. Jamjoom explores the human ego through his more recent and upcoming artistic endeavors, particularly a sci-fi series on religion and the ego titled ‘Balance’ that he recently completed. He tackled a variety on questions from the audience towards the end of the conversation. These questions ranged from his own religious views to his experience working with Maher Zain, one of the most popular contemporary musicians of the Islamic world, who has previously worked with American pop artists such as Britney Spears and Lady Gaga. At a time when most of society is deeply polarized along religious and political lines, artists such as Hamzah Jamjoom are making a huge contribution towards achieving some sort of understanding and stability by portraying various religious and cultural backgrounds through alternative discourses that challenge negative stereotypes. In order to cultivate empathy and cross-cultural understanding, it is of vital importance to continue engaging in dialogue with people holding religious and political views that are very different from our own. Previous StoryWhy is Collaboration Crucial for Democracy to Function?